Following yesterday’s entirely unintentionally St Patrick’s Day themed green eyeshadow (which was disappointingly not very long lasting. Maybe I needed a primer?) 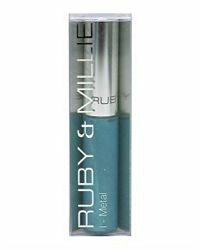 I’ve gone for a solid line across my upper lash line of Ruby & Millie’s i-Metal in Metallic Blue today. I bloody love these, they go on easily and once they’re set, they DO NOT MOVE. Which is just as well as I’m out for drinks tonight and don’t have time to be fannying around reapplying. I’ll let you know how it goes*. You can get yours from Boots or Boots online here.